Home Art & Entertainment Seek and you will find…perhaps! Seek and you will find…perhaps! I spy with my little eye something beginning with A, and B, C too and, of course, D. In fact, with every turn of the page in Jenna Brockett’s new book, A, B, Seek I spy all sorts of animals and objects lurking in a black and white network of leaves. than one adult has been seen trying to spot just what is hidden in the foliage. “I started the book in 2015 after first experimenting with just one letter, the letter M. People loved the idea and I could see the potential of using the whole alphabet to create an educational book which would test children’s powers of observation. With more than 1000 images to find hiding amongst the 26 letters, this book offer hours of fun and, as Jenna says, can be explored two ways – by looking at the word list then finding the corresponding items in the picture or by studying the picture and writing down as many hidden objects as possible before comparing them to the list. Aimed primarily at children aged two to 12 years, and ideal as a Christmas or birthday gift, nevertheless many people have added the book to newborn baby gift parcels, recognising that the black and white images provide early interest and stimulation for babies. Born and raised in Pakuranga, this former Elm Park Primary and Edgewater College student says she has always had a bent for art, and craft too. 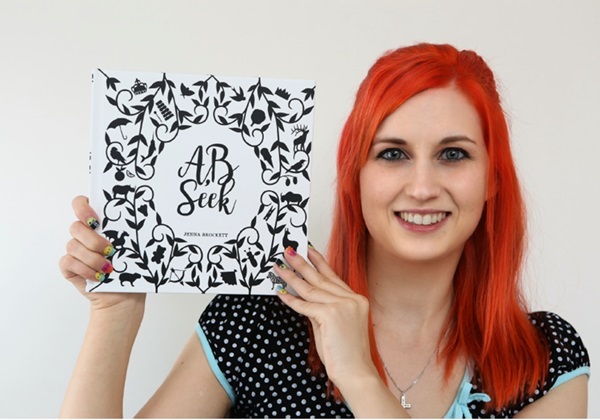 While A, B, Seek (RRP $30) is available from selected bookstores, Jenna mostly sells from her online site – www.prints-princesses.co.nz or at weekend markets. Balmoral on December 9, 5-9pm.